Though her words may occasionally be cribbed from more popular First Ladies, Melania Trump does speak them in English. 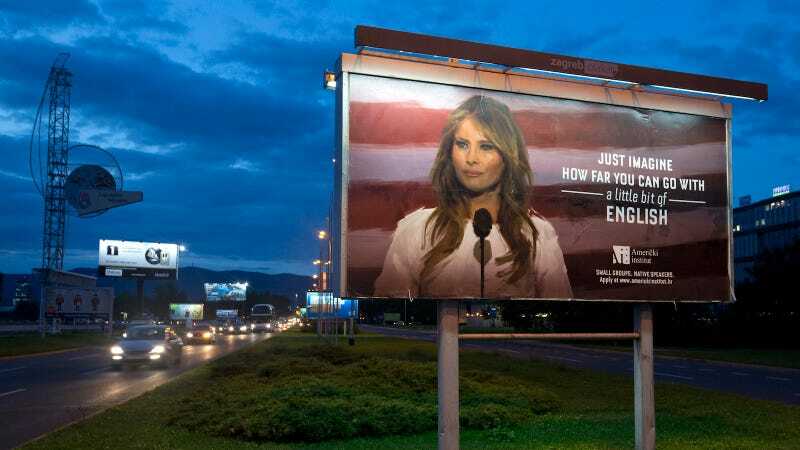 Billboards in Croatia celebrated(?) her linguistic abilities in an advertisement for a local language school, but she was none too pleased and quickly got them taken down. The Associated Press reports that Trump wasn’t too happy to see her face plastered next to the words, “Just imagine how way you can go with a little bit of English.” Yes, you too could leave your home country and marry the human equivalent of the congealed slime on top of an old lump of Spam. And then live in the White House, when you’re finally forced to. Nonetheless, all five billboards are gone now, after Trump’s lawyer threatened the school with a lawsuit. Guess she’s not as proud of her accomplishments as she should be. Will Melania Ever Hold Donald&apos;s Stubby Hand Again?